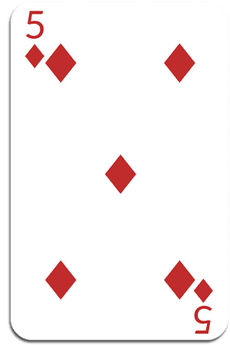 "The Five of Diamonds has had a recent lifetime of service, perhaps even servitude. They are incredibly good at it, for many reasons. Theirs is a compassionate and discerning heart, a mind for administration, an approachable sense of humor, and a willingness to innovate and initiate their big ideas with courage and optimism. By the time they reach the age of twenty-five, they likely are already well-traveled. They are deeply service oriented as well. It’s as if they have had many lifetimes of service and now is their chance to have some fun. Their thirst for experience and exploration takes them on lots of adventures early in life, before they settle down to a more structured routine and/or the responsibilities of family. When that time comes, they often have one or more family members who become ill or require special care which could include mental illness. Romantically, they seem to be ever in pursuit of the ideal relationship. They tend to be fulfilled by..."
​Pisces, you have a Planetary Ruling Card that IS one of your Royal Archetype Cards (Jack of Diamonds). That report is included in the Kit below.